Thank you to everyone who participated! The survey is now closed, results and analysis will be shared at the beginning of April! We are surveying! Please click the link below, and answer a few questions about your CS and Ex-CS experiences. Results coming in the near future! PLEASE BE AWARE THE SHORT-ANSWERS WILL BE VISIBLE! Please do NOT include any e-mail address or other personal information. I am definately an EX Cser.. Please add me to the list. CS messed me up for years emotionally and I had a sister with Petite Mal Epilepsy who was never treated and is not brain damaged..
My dad would have watched me die rather than take me to a doctor..
— My life was saved in a most dramatic way through the truth of CS. Our marriage was saved by CS after 6 years of separation and numerous human attempts to save it which all failed. Many other “miracles” followed.— Where CS has gone wrong as an institutionalized religion is in the extremism about use of medicine disqualifying a person from CS help or treatment. It has also watered down the teachings and tended to deify the founder, Mary Baker Eddy, while thereby lessening the focus on Jesus Christ, which it was never meant to do. I am not a member of the CS church nor of any other, but I greatly appreciate the deeper and living sense of the scriptures that Christian Science reveals and inspires, especially the enigmatic statements of Jesus that are so important and that are mostly ignored by mainstream Christianity. If one is not getting help in CS with a physical problem and it becomes too severe, it makes sense to seek out medical treatment to see if it can meet the need. The one should not have to exclude the other. Nonetheless, whether one uses medicine or not, the purity and depth of the essence of the teachings, on the nature of spiritual perfection or the kingdom of God at hand, are of endless blessing and enable us to truly love our enemies and everyone divinely with signs following, just like Jesus said they would. My name is Sylvia and I am a student at the College of Charleston in South Carolina. I am a Religious Studies major and am currently doing a project on Christian Science. I have just read this comment of yours and would be extremely interested in asking you a few questions for my project if you do not mind. Feel free to reach out to me via email at [email protected]. Thanks so much! Hahaha – Jane! You’re awesome. 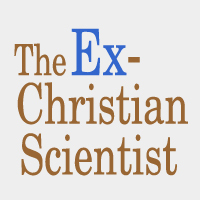 Robbin – Are you currently a Christian Scientist? Or did you leave it now? I am guessing, if it was 1917, that the “healing” you’re talking about was either a built in immunity to the disease, or it was a misdiagnosis. Or she had a fighting spirit inside her. I know I have a fighting spirit inside me. My story is running as a monthly series, and I believe it was either a misdiagnosis or my own fighting spirit that “saved” me from dying after a medically diagnosed case of pneumonia when I was a baby. Too many Christian Scientists know someone who dies prematurely thanks to not getting medical care. They die alone and in pain. And none of their community asks “what happened?” And they probably have their will or their family members instructed not to do an autopsy. It’s so sad. Christian Scientists die 18th Century deaths way too often. Some of the old ones, though, are made of very healthy stock, thanks to being raised on farms. So they live to a ripe old age. I am glad to say before I left the church, that I was seeing more people turn to medical care. But they did it alone and afraid. They are so afraid of doctors, and they have no one to talk to about it, for fear of being judged & ostracized from their church. It’s all just sad & scary. Robbin, I wish you much goodness in your life, and it is my hope you will leave it if you already haven’t. It’s amazing what happens to your perspective on old stories, once you leave Christian Science. Often a healing becomes the reason people hang on to cs well past the point where they know it is failing them . I contend that God does answer prayers and heals miraculously. But it is God who heals, not the result of a person knowing the truth.